My most-used hashtag lately has been #crazycanninglady. What you see above is what I made from 100+ pounds of tomatoes over labor day weekend: 38 pints of salsa; 8 quarts, 5 24 oz jars, and 4 pints of crushed tomatoes; 5 pints of thin tomato sauce; and 12 pints of tomato juice that I squeeze out of the seeds and peels at the end of the weekend. 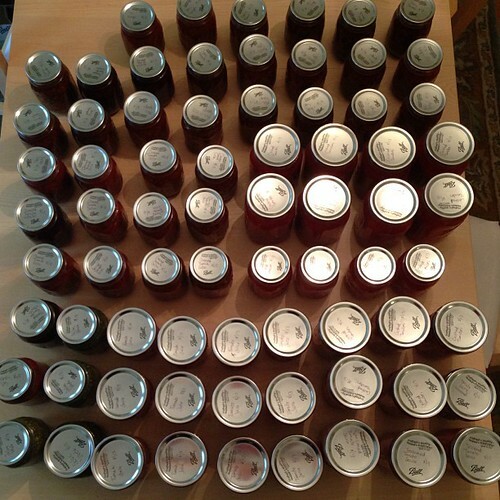 I bought 4 cases of seconds (the less-than-perfect tomatoes that go for cheap and are just fine for canning) for a mere $12 per case, and then because I'm a nutter I bought another box the following weekend used the whole box to make another 7 pints of thick tomato sauce. Understanding Acid and pH in Boiling Water Bath Canning from Food in Jars.